At the 2019 PEN America Literary Gala, Richard Robinson, Chairman of the Board, President, and Chief Executive Officer of Scholastic, will be the annual event’s Publisher Honoree. 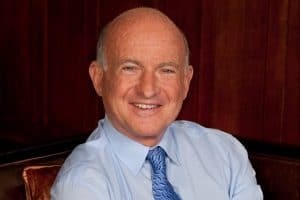 Richard Robinson has been President of Scholastic Inc. since 1974, Chief Executive Officer since 1975, and Chairman of the Board since 1982. Founded in 1920 as a single classroom magazine, Scholastic has become the world’s largest publisher and distributor of children’s books, a leading provider of print and digital instructional materials for Pre-K to grade 12, and a producer of educational and entertaining children’s media. During Mr. Robinson’s tenure, publishing records were shattered with the release of each book in the Harry Potter® series by J.K. Rowling, and the script book of the 8th Harry Potter story, Harry Potter and the Cursed Child Parts One and Two, was the best-selling adult or children’s book of 2016. Mr. Robinson also led the development of popular series such as Dav Pilkey’s Captain Underpants® and Dog Man, The Hunger Games, Clifford the Big Red Dog®, The Baby-Sitters Club®, Goosebumps®, The Magic School Bus®, and more. Mr. Robinson has been a lifelong supporter of creative young people through the Scholastic Art & Writing Awards, the nation’s longest-running and most prestigious recognition and scholarship program for talented teens. The program was started by Scholastic in 1923, and today is administered by the nonprofit Alliance for Young Artists & Writers, reaching more than 300,000 students annually. Throughout his outstanding career, Mr. Robinson has received numerous honors, including the Robin Hood Foundation’s John F. Kennedy, Jr. Corporate Hero Award and most recently, the 2017 Literarian Award from the National Book Foundation. In 2002, Reach Out and Read established the Richard Robinson Award to recognize his commitment to improving literacy for all children.